Seismologists have discovered a massive magma reservoir beneath the Yellowstone supervolcano in Wyoming, US, that suggests its volcanic system could be more than 5.6 times larger than was previously thought. Although it was already known that Yellowstone had one magma reservoir, located about 5-16km (3-10 miles) below the surface, the new study, published in Science, has revealed another, much larger reservoir sitting directly below the first, located around 20-50km (12-30 miles) below the surface. This reservoir is thought to have a volume of around 46,000 cubic km – compared to a volume of around 10,000 cubic km for the shallow reservoir. To make their discovery scientists analysed the vibrations made by earthquakes that passed beneath the volcano. The technique not only sheds light on this volcano’s potentially life-threatening eruptions but it could also help us understand other volcanoes such as Calbuco, which is currently erupting in Chile. Luckily no sign of an eruption anytime soon. 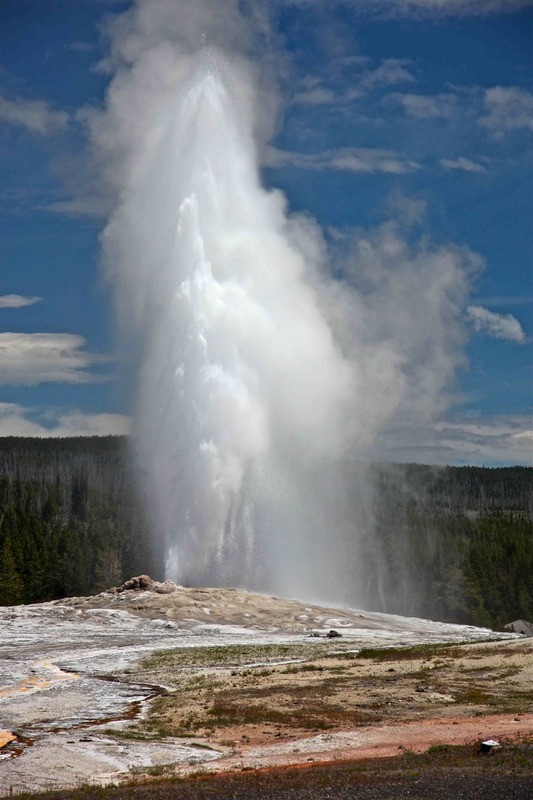 Yellowstone volcano is composed of an immense volcanic crater – known as a caldera – more more than 70km (44 miles) in length, most of which lies within Yellowstone National Park. The volcano rarely erupts lava (it last did so about 70,000 years ago, but the magma lying beneath the surface gives rise to spectacular geothermal features, such as geysers and colourful hot springs. The last large eruption at Yellowstone was 640,000 years ago, and ejected around 1,000 cubic kilometres (240 cubic miles) of volcanic material. This cataclysm created the Yellowstone caldera. To get an idea of the scale of this, the largest eruption in recorded history, Mount Tambora in 1815, erupted about a sixth of that. Magma reservoirs are thought to occur beneath most volcanoes, and play a crucial role in the dynamics of eruptions. However, they are too deep, and conditions within them too extreme, to be measured directly so volcanologists have to infer information about them using other means, such as measuring seismic waves. These waves travel more slowly when they pass through molten rock, and accordingly the group were able to use the velocities of the earthquake waves to infer the presence of a large, deep zone of partially molten material. 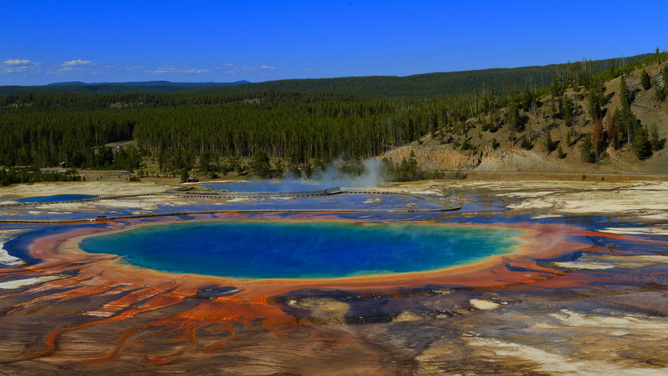 The magma stored in the deeper reservoir probably doesn’t cause eruptions at Yellowstone directly. Instead, it likely acts as a “feeder” for the smaller, shallower reservoir – which is the ultimate source of the volcano’s catastrophic eruptions. 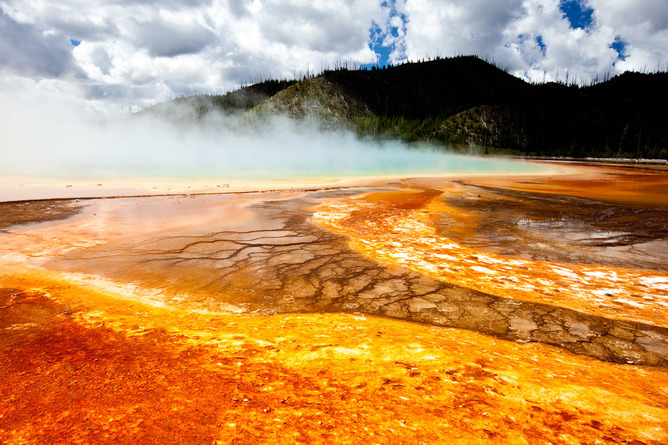 Scientists had suspected the existence of a second magma reservoir at Yellowstone for some time, but this new evidence is among the strongest support of the theory to date. The discovery of this second magma reservoir may also help to explain a mysterious feature of the Yellowstone volcano: its carbon footprint. Carbon dioxide gas is commonplace at volcanoes (it is given off by rising magma), but Yellowstone’s output, which is around 45,000 tonnes of CO2 each day, was too high to be explained by a single magma reservoir. But according to the study’s authors, the presence of the new reservoir is enough to account for the volcano’s CO2 flux. Eruption of Calbuco, seen from nearby Puerto Montt. 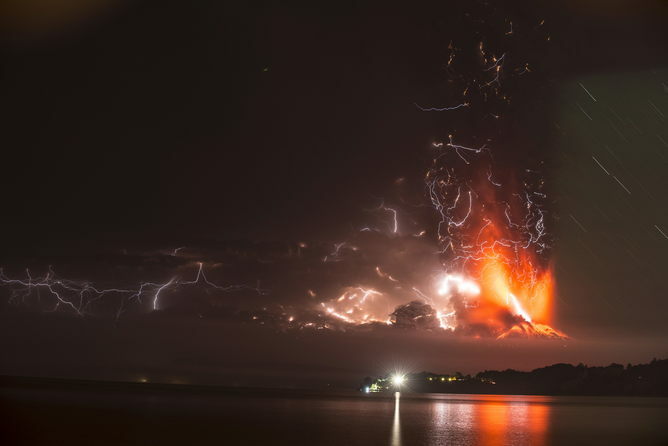 If the high-resolution seismic imaging technique used in the study could be repeated at other volcanoes whose deep structure is poorly understood – such as Calbuco volcano in Chile – volcanologists might eventually be able to understand how such eruptions take place. The first stirrings of volcanic eruptions happen far below the surface. If researchers can emulate the findings at Yellowstone at other volcanoes, it can only tell us more about the risks they pose.